I’m a sucker for new tools. Look at these beauties! I almost hate to get them dirty! But they will be well-worn in in no time I’m sure. In any event, I found these tools on his website. It’s always a pleasure to use tools with real wooden handles. 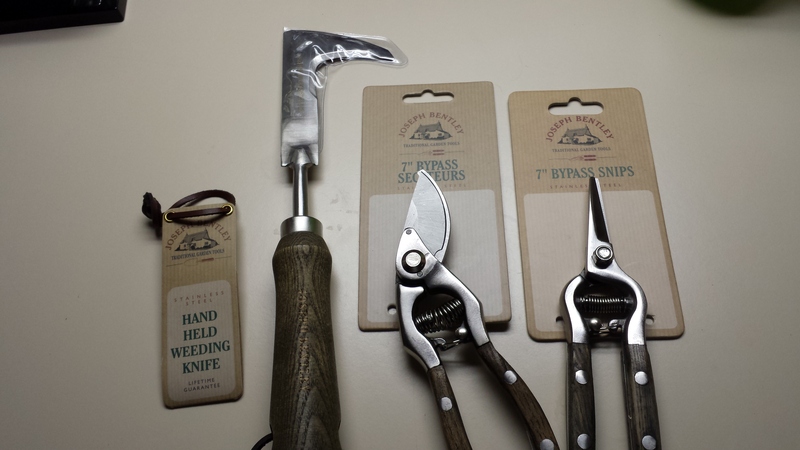 The snips I will probably try to restrain myself and keep inside (although once I have a tool in my hand and start moving around, who knows where I end up, particularly in warm weather!) I find this sort of tool is particularly great for herbs as well. Not sure what I’ll do with the secateurs. I have enough house plants that they could remain strictly an indoor tool as well. I’ll have to see. I was a little disturbed that the instructions said that it was great for rooting out moss. Who on earth would want to do that? But to each his or her own, I guess. Ooooh, nice! I am a tool junkie also. 😉 Most of mine were bought during the 1980s and 1990s, back when Smith & Hawken was selling decent British-made gardening tools. Nowadays everything seems to be made in China (even the ones that are marketed to evoke the British ones, LOL). I too bought most of mine in the 90s–when I “married” my house and needed to upgrade from an annual gardener to a serious perennial and shrub gardener. I’ve always been a fan of Lee Valley and have gotten some beautiful tools from them. Back in the day when the exchange rate was better, their tools were very reasonably priced. Now they are market rate, but their tools are still beautiful! And yes, Smith and Hawken had some fabulous stuff. I have a pot cleaning brush from them that is great!